Since its launch in 2012, more than half a million people have created nearly 10 million maps, apps, and datasets in ArcGIS Online, the world’s most prominent software-as-a-service (SaaS) mapping platform. And this year’s midyear update infuses the complete, cloud-based solution with even more impressive capabilities. Hosted tile layers are now more efficient, automatic, and economical. When publishing hosted tile layers from hosted feature layers, users can create tiles automatically. This means the tiles are generated only when requested, such as when a user zooms to an area on the map. Once the tiles are created, they are cached in users’ hosted storage so they don’t have to be generated again. Tiles also automatically refresh when the features in the source feature layer are updated. And Esri has reduced the cost of publishing tiles, so it only takes one credit to generate 10,000 tiles. 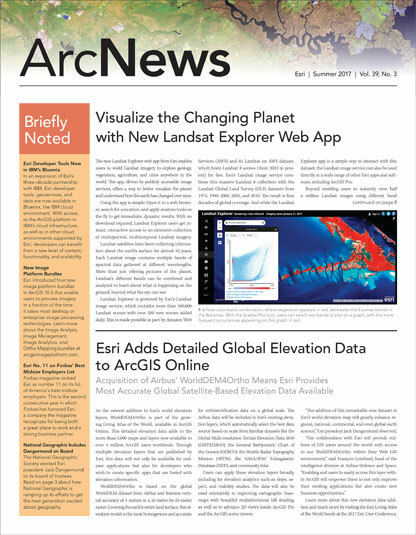 To learn more about the updates to ArcGIS Online included in this release, visit the ArcGIS Online What’s New page and check out the ArcGIS Online blog.